Captain Ashley Williams has set Swansea the target of consecutive league wins for the first time since 2012. The Swans beat Newcastle last weekend and host Aston Villa on Saturday. The Welsh club have not won back-to-back games in the Premier League since the victories over Arsenal and West Bromwich Albion in December 2012. "We know we haven't won back-to-back league games for quite a while, and that's not good enough considering the squad we have," said Williams. "It's something the players want to address and we have that opportunity at home against Villa on Saturday. "To win this game would not only give us momentum but it will also add some points to our tally. "We want to build on the result at Newcastle and finish the season really strongly." The Swans recorded a vital 2-1 win against Newcastle United at St James' Park on Saturday to edge themselves closer to Premier League safety. Wilfried Bony's 92nd-minute penalty completed a memorable comeback at Newcastle to move the Swans onto 36 points - six clear of third-bottom Cardiff - with three games to go. Swansea head coach Garry Monk said his side have played much better this season than they did against Newcastle but come away with nothing on previous occasions. 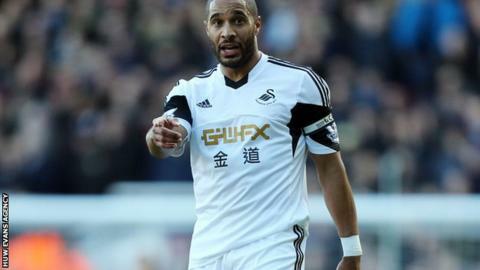 Williams hopes the win against Newcastle will act as a catalyst for Swansea against Aston Villa. "It was great to get a win at Newcastle last weekend," said Williams. "We pushed hard to the end and we got our reward, and the celebrations between the staff and players on the pitch showed the unity we have in this club. "And it was important to include the supporters in that. "They paid a lot of money to get up to Newcastle and it was a long trip for them too, and we wanted them to know how much we appreciated that effort. "We battled back from 1-0 down and the support we got from the fans was immense."